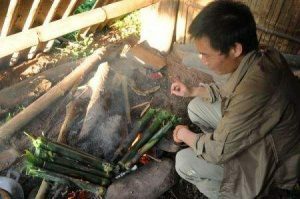 In most provinces the snacks are so complex and contain so many ingredients that they invariably appear to us like full sized meals, whereas in Yunnan the local snacks are characterised by their tasteful simplicity. 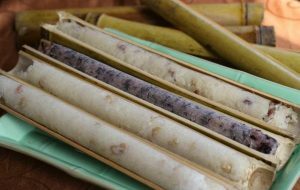 From Dali to Lijiang, each county in Yunnan boasts its own unique snacks and usually they are the result of ethnic minorities who have adapted their cooking styles over decades. While the local Tibetan people have a preference for yak’s milk yogurt, the Bai ethnic minority love cheese, and the Naxi people have a fondness for seasoned flatbreads. This incredible variety means you’ll never be at a loss to find a tasty titbit once your stomach starts rumbling! 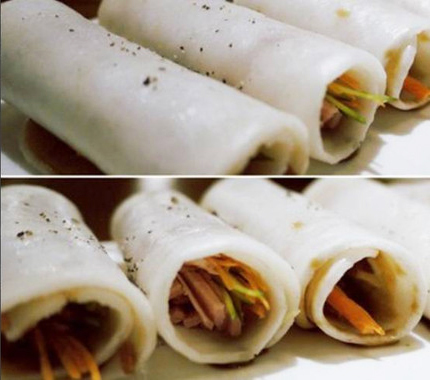 Xuanwei Ham is one of China’s top three most famous ham dishes and, once you catch the scent of this sweet salty meat, we’re sure you’ll see why. 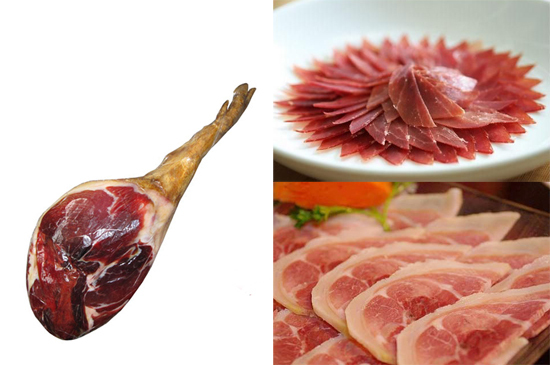 This type of ham originates from Xuanwei County in northeastern Yunnan and has a history of over 250 years. It is normally cured during the winter and left to ferment for upwards of half a year! The ham comes from the local Wumeng hogs, which provide perfectly marbled meat that is both salty and sweet without being oily or greasy. The ham itself is incredibly adaptable and can be stir-fried, deep-fried, steamed or added to a stew. In some parts of Yunnan, even the moon cakes are stuffed with Xuanwei ham and are heartily enjoyed during Mid-Autumn Festival. It is mainly used to add flavour to other dishes or to make broth, but makes a sumptuous snack in its own right. 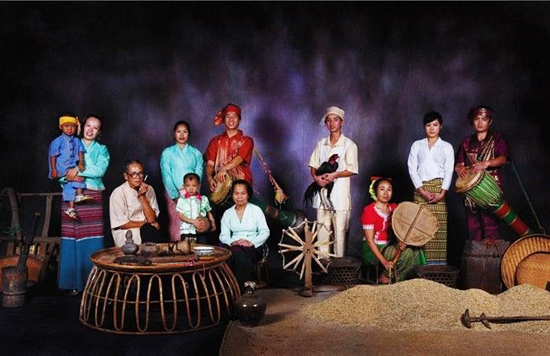 Rushan is almost exclusively found in Dali Prefecture and originates from the Bai ethnic minority. It is made using a type of cow’s milk cheese that is flat and has a somewhat leathery texture, giving it the appearance of a folding fan. This is what earned it the name “rushan”, which literally means “milk fan”. The slivers of cheese are usually fried or grilled and then wrapped around a stick, resembling a popsicle. Sweet condiments will then be spread on the cooked cheese, such as sweetened condensed milk, rose petal infused honey, chocolate syrup, or fruit preserves. The finished product is mouth-wateringly crispy and the strong, milky flavour of the cheese is perfectly complimented by the thick sweetness of the condiments. 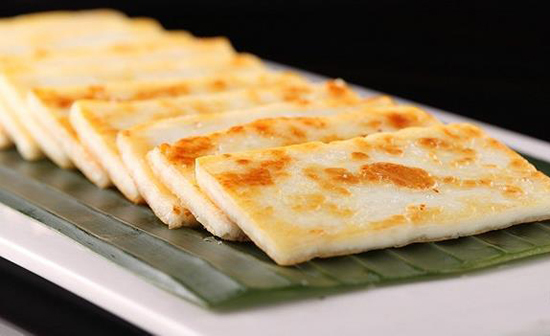 Once you’ve felt these flaky strips of cheese melt in your mouth, we’re certain you’ll be a “milk fan” too! 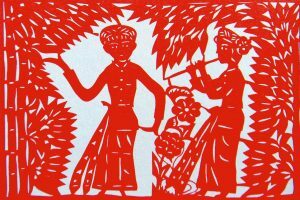 Like rushan, rubing also originates from the Bai people of Dali Prefecture but is made using a type of goat’s milk cheese. Its name literally means “milk cake” as blocks of this firm, white cheese greatly resemble slices of scrumptious sponge cake. Thick, juicy slices of rubing are pan-fried and then dipped in either a mixture of salt and chilli or sugar depending on your personal preference. In some restaurants, it will even be stir-fried with vegetables in a similar way to stir-fried tofu. The delightful sharpness of the goat’s cheese goes incredibly well with both salty and sweet seasonings, making it a versatile snack that is as filling as it is delicious. Erkuai is a type of rice cake that is made by taking high-quality rice, soaking it in water, steaming it in spring water, and then pounding the cooked rice down into a soft mush using a giant pestle and mortar. This rice mush is hand-kneaded on a wooden board to remove all of the air bubbles and then moulded into its characteristic pillow shape. These soft, plush, doughy cylinders look so comfortable that you’ll be tempted to rest your head on them! Erkuai is a popular staple food throughout Yunnan and is indispensible during their Spring Festival or New Year celebrations. Like Xuanwei Ham, it is an incredibly versatile food and can be boiled, roasted, or even pan-fried. For breakfast, many locals love nothing more than to roast a few slices of erkuai over a charcoal fire and spread handmade fruit jam over them like a spongy, warm croissant. In restaurants, it is often served stir-fried with a mixture of vegetables, dried red chillies, Sichuan pepper, and salt. 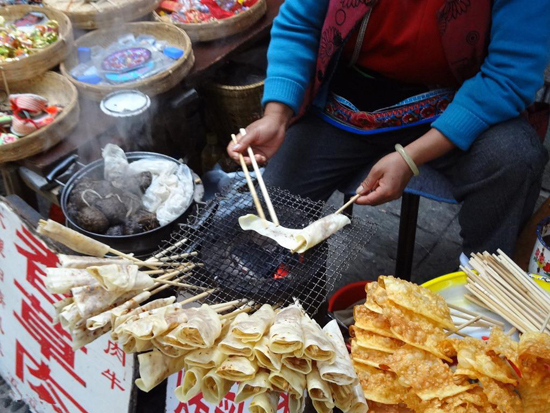 On the street, you’ll find it grilled and rolled around a strip of fried dough known as youtiao (油条). This snack can either be served sweet, with a sugary brown sauce and peanuts, or savoury, with a fermented kind of tofu known as lufu (滷腐) and bean sprouts. This comforting snack resembles a burrito and its luxurious layers of flavour are sure to leave you wanting more! This style of baba is just one of many found throughout Yunnan and was adapted by the Naxi people of Xizhou town near Dali. Baba is a type of flatbread made from wheat flour dough that has been flattened into a circular shape. 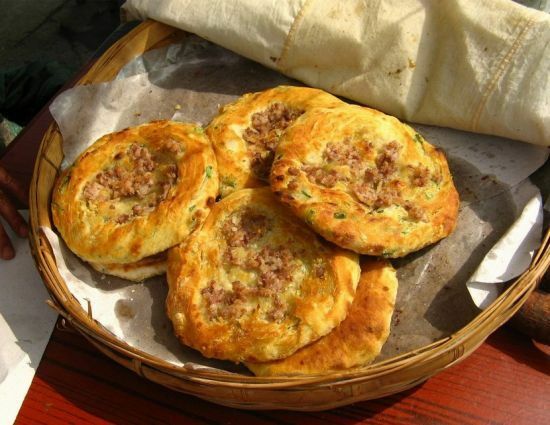 The lardy flatbread is then either topped with minced pork and spring onions or filled with sweet red bean paste, and baked in oil until the dough has gone a golden-brown. Its circular shape and use of meaty toppings has earned it the amusing nickname “Xizhou pizza”. The sweet baba taste like plump pastries, while the savoury baba have a pleasant saltiness that accompanies the rich dough perfectly. Though they may not taste exactly like pizza, Xizhou baba are a takeaway snack that you’ll surely miss once you leave Yunnan. Taking up only 0.4% of the country’s area yet somehow managing to support 20% of its plant species and 25% of its animal species, the protected areas around the Three Parallel Rivers are some of the most bio-diverse in the world. Altogether 15 protected areas along the three rivers were made into a World Heritage Site by UNESCO in 2003 because of their biodiversity and phenomenal landforms. 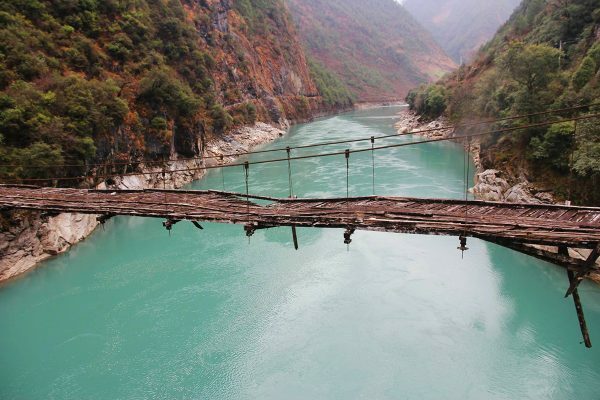 The site represents the point where the Yangtze (Jinsha), Mekong (Lancang) and Salween (Nujiang) rivers run parallel for over 300 kilometres. This is rather miraculous in of itself, considering these are the 3rd, 12th and 25th longest rivers in the world respectively and, while the Yangtze eventually flows into the East China Sea at Shanghai, miles away the Mekong empties into the South China Sea at the city of Ho Chi Minh in Vietnam and still further the Salween flows into the Indian Ocean at Moulmein in Burma. Some of the gorges in these areas boast a depth of over 3,000 metres (9,800 ft.), making them twice as deep as the Grand Canyon! At the bottom of the gorges the climate is sub-tropical, whilst along the top there are mountain ranges sporting over 100 snow-covered mountains that are higher than 5,000 metres (over 16, 400 ft.). With all these different temperature zones, you can see how this area has come to support so many plant and animal species. The protected areas are inhabited by a phenomenal 6,000 species of plants, 173 species of mammals, and 417 species of birds, including red pandas, snow leopards, Lady Amherst’s pheasants, Asiatic wild dogs, and the incredibly rare Gaoligong Pika. The animal species found here are a wonderful mixture of the wildly beautiful and the painfully cute! Of the many snow-capped mountains littered through the Three Parallel Rivers National Park, the Meili Snow Mountain is considered the most famous. Its tallest peak, Kawagarbo, looms over the surrounding countryside at an elevation of over 6,500 metres (22,100 ft.) and the whole range itself is considered sacred by the local Tibetan monks. As of 2001, it is illegal to climb the mountain as its status as a religious site means it would be sacrilegious to set foot on it. So be sure not to climb it or you’ll be arrest for high treason! 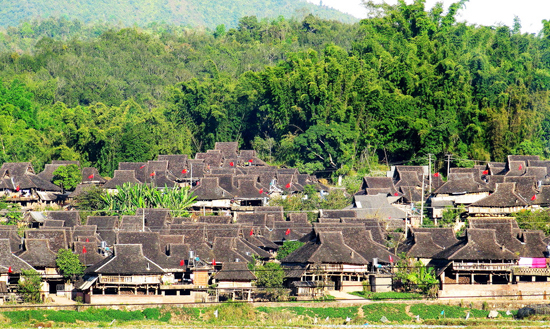 If you travel to the town of Shenping in Yunnan, you’ll be rewarded with a stunning view of the mountain range and may even see a few of the Tibetan pilgrims completing their circuit of it on foot. The Meili Snow Mounta in is part of the eight geographical clusters that make up the national park and each one offers something new to its visitors. The Gaoligong Mountain Area is the most extensive and, as such, features cavernous gorges, dizzying cliffs, bubbling streams, thundering waterfalls, primeval evergreen forests, and settlements of the 25 ethnic minorities that call the area home. The Yunling Mountain Area is home to the most diverse community of animal species, including the elusive Yunnan golden monkeys that can be found nowhere else on earth. And the Haba Snow Mountain Area boasts a modern oceanic glacier, an Indian azalea forest, alpine lakes, snow-capped mountains, and lava formations. Each of these clusters feels like an ethereal paradise and, with all of these choices on offer, you may never find your way out of the mountains! From the luxuriant forests to the reddish sandstone Danxia landforms and the verdant alpine meadows, the protected areas of the Three Parallel Rivers represent a visual feast that should not be missed. You can access parts of the national park from the cities of Dali, Lijiang or Shangri-la in Yunnan. Most of the treks can take upwards of a week or more, so say goodbye to your creature comforts and prepare to get a little wild! 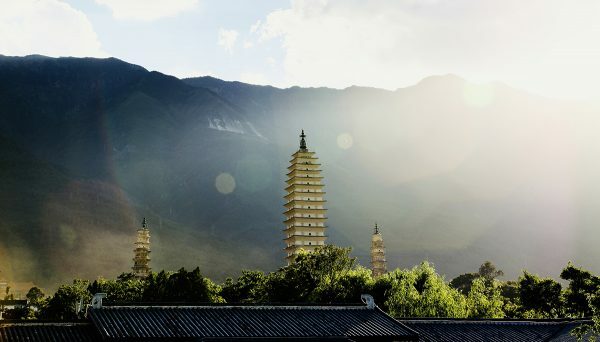 Rising up alongside the magnificent Cangshan Mountains, the Three Pagodas of Chongsheng Temple are an architectural wonder that is certainly protected by the gods. In 1925, during what was considered the most severe earthquake ever to hit Dali, only one out of every hundred buildings survived. 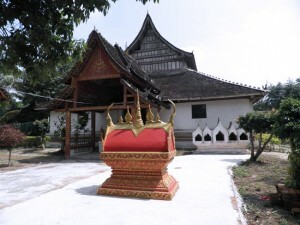 Yet the Three Pagodas came out unscathed. Over a period of more than a thousand years, these towering monuments have witnessed numerous natural and man-made disasters, and have miraculously remained undamaged to this day. 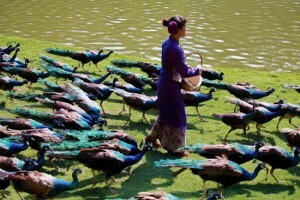 Nowadays they are the must-see tourist attraction in Dali and one of the few enduring remnants of China’s ancient past. They are located about 1.5 kilometres away from Dali Ancient Town and rest at the foot of Yinglo Peak on the Cangshan Mountains. All three pagodas are made of brick that has been covered in white mud and they are arranged on the three points of a symmetric triangle. It is believed they were built for auspicious reasons as, according to local legends, Dali was once a swamp that acted as a breeding ground for dragons! 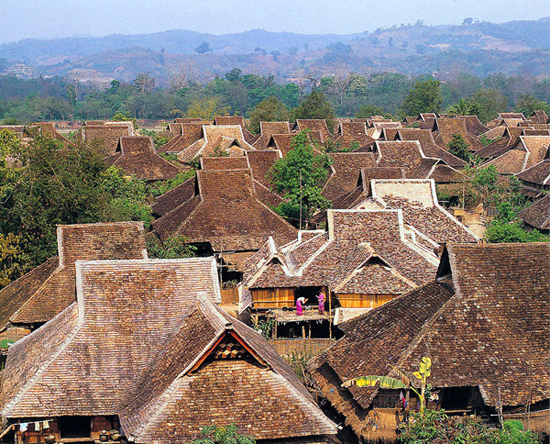 When humans came to populate the area, they did not want to anger the frisky dragons, as it was well-known that dragons could cause natural disasters, so they built the three pagodas. Why, you ask? Because dragons are terrified of pagodas, of course! The ancient people believed these three pagodas would deter the dragons from returning and, as there hasn’t been a dragon sighting in over 1,000 years, I think we can firmly say that it worked. The main pagoda at the centre, known as Qianxun Pagoda, is both the oldest and the most magnificent. 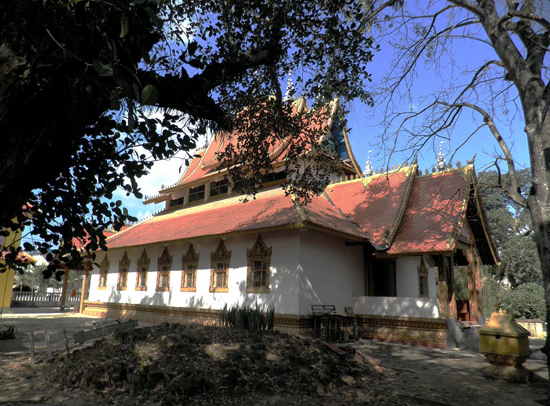 The Nanzhao Kingdom (738-902) ruled over most of Yunnan during the Tang Dynasty (618-907) and King Quan Fengyou of Nanzhao built the pagoda sometime between 823 and 840 AD. At a colossal 70 metres (227 ft.) in height, it is one of the tallest pagodas in Chinese history. It is sixteen storeys high and is distinctly square-shaped, giving it a powerful elegance amongst the looming mountains. As you marvel at this fine pagoda, it’s hard not to detect its resemblance to the Small Wild Goose Pagoda in Xi’an. Don’t worry; your eyes aren’t playing tricks on you! The designers of Qianxun Pagoda reputedly came from Chang’an (modern-day Xi’an) and this is why the pagoda is built in the traditional Tang-style. Tragically, the ladder that recently provided access to the upper storeys has collapsed so there is currently no way to climb Qianxun Pagoda. 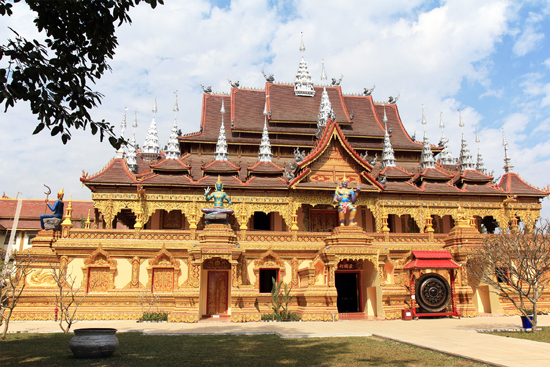 In 1978, during a major restoration project, over 700 Buddhist relics, including statues made of gold, silver, wood and crystal, were found inside the pagoda. A number of ancient Buddhist documents and over 600 traditional medicinal ingredients were also excavated. These artefacts have provided historians with invaluable information about the history of the region, but have failed to answer the most pertinent question; how did so many people manage to miss spotting 700 statues? I could understand walking past a couple of statues without noticing them but not 700! The two sibling pagodas were both built about 100 years after Qianxun and are each about 43 metres (140 ft.) tall. Unlike their big brother, their architectural style resembles that of the Song Dynasty (960-1279), as they are octagonal in shape and are ten storeys high. Behind the three pagodas, the Juying or “Reflection” Pond mirrors the image of the snow white towers jutting out amongst the mountains. For reasons unknown, one of the smaller pagodas leans slightly to the side and is reminiscent of Italy’s Tower of Pisa. 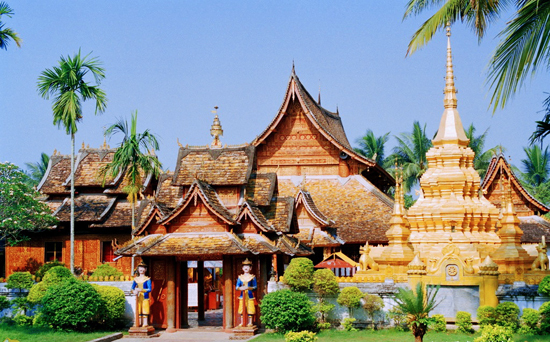 If you fancy getting a fun snapshot of your trip, you can try “holding up” this pagoda in a photograph. You’ll end up with an interesting souvenir, but the other tourists might think you’ve gone a little crazy! Chongsheng Temple, the pagodas’ mother building, was a Buddhist temple that acted as the royal temple of the Dali Kingdom (937-1253), which ruled the old Nanzhao Empire during both the Tang and Song dynasties. It was originally built around the same time as Qianxun Pagoda but was tragically destroyed during the Qing Dynasty (1644-1912) and had to be rebuilt in 2005. It is now a massive complex that winds its way up the Cangshan Mountains. If hiking isn’t your thing, on the nearby Marble Street you’ll find stalls where you can purchase locally made craftworks, marble carvings or brick-paintings. 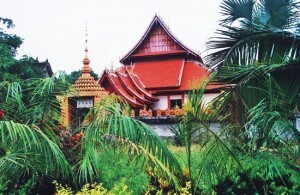 Nowadays, tourists can visit both the temple and pagodas at almost any time. 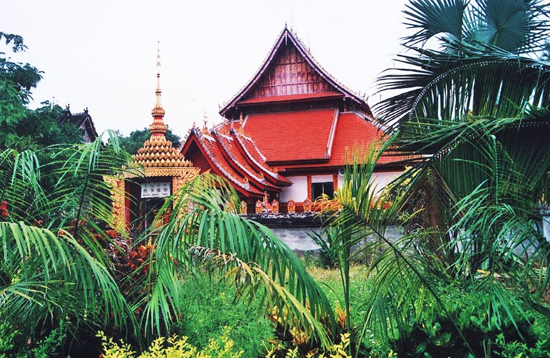 During the day, the pagodas rise up through the mist and stand tall, protecting the region from amorous dragons. At night, they are beautifully illuminated and appear almost ethereal, like towers from long forgotten fairy tales. If you’re taking a trip to Dali, set aside a few hours to make the trip and marvel at one of the last vestiges of the ancient Nanzhao and Dali kingdoms.